Interesting and/or humorous thoughts from the Cube of Deep Thought, a cubicle somewhere deep in technological America. Some thoughts are controversial and are posted because they are. Comments in good taste are always welcome. 4 TB is the amount of data that Intel projects will be generated by an autonomous motor vehicle. Considering the number of vehicles on the road, this represents a staggering amount of data. How will data centers keep up? The first experimental version of Ethernet networking ran at 2.94 megabits per second (Mbps) in 1973. By the time it became an industry standard in 1982, its speed had increased to 10 Mbps. Gigabit Ethernet offered 1 Gbps in the late 1990s, but it took many years for wide adoption because of the increased expense. 10 Gbps Ethernet was produced starting in the mid-2000s, but it is expensive and used mostly in specialized environments. Finally, 40 Gbps Ethernet has been under development for years. The Googles and Facebooks of the world are hoping that it will help to alleviate the bottlenecks they are feeling in their data centers. 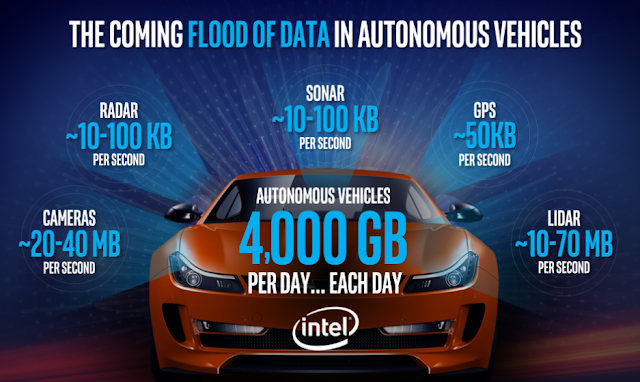 Data, data everywhere and now our cars are looking to add to the pile. What a time we're having!